My Apple Watch sport has arrived! First off the size: I ordered the slightly smaller 38mm Apple Watch Sports with the salmon pink band. After taking it out of the glorious packaging, I have to admit I was slightly underwhelmed by the size… There is definitely an optical illusion when looking at photos as I did (it looks a lot bigger in photos than in real life – the screen is only just a little bit bigger than a two dollar coin) but after using and wearing it, the size doesn’t bother me for the functionality, it’s just more how it looks on my wrist. Third party apps: All the reviews I read beforehand pointed out how these take a while to load. I haven’t come across any in particularly taking very long and in my opinion since the update I did this morning (17/5/15) to Apple Watch iOS 1.0.1 it seems to have improved the speed in loading third party apps like Instagram seems to be better. Other things I would point out about third party apps would be there are only a few and not all of them are useful in this early stage. Fitness and health: So when you set it up it will ask you for your information like your height and your age etc. It will determine the recommended calorie burn and throughout the day, it reminds you how often you stood up and how much you’ve moved throughout the day sending this information back to the Health App, which now make sense as before the Apple Watch I never opened the app. Battery life: Fine it needs to be charged every night and it will last all day. Your phone, however, will suffer slightly. 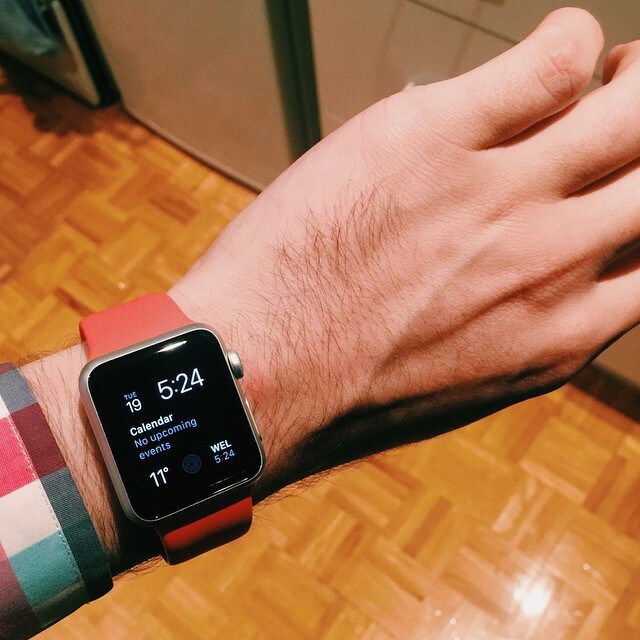 Bluetooth: The Apple Watch uses Bluetooth to connect to your iPhone. One of my concerns that no one could answer prior to purchase was if your phone is connected to watch how will handle other Bluetooth connections like getting into your car? Well, I was pleasantly surprised when I jumped in my car this morning and had my Apple Watch connected to my iPhone it also allowed my car to connect to my iPhone at the same time! Faults and issues: *Update* it appears Apple is one step ahead of me again and had already thought of this. In the watch app on your iPhone click on the clock and you can change the description! Yay. 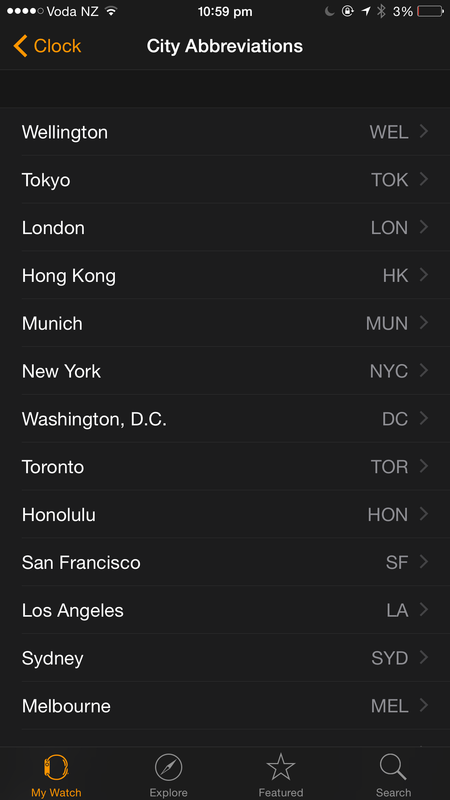 The one glitch (if you could call it that) would be that the time is pulled from your iPhone, great if you live in the rest of the world however for little New Zealand – Wellington is the only city Apple recognises on your phone in the clock app. 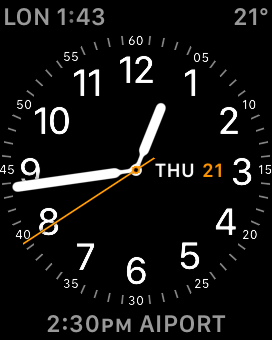 The Apple Watch then uses that information and displays WEL (on some clock faces) as the time which is rather annoying if you live in Christchurch like me! Overall: I like it and it is useful. It will be interesting to see how this evolves over time. Apple Watch 2 will be out before we know it and I will buy the larger version and maybe even move up to a more expensive model. But as a rule, early adopters should always go with the cheapest model first.